At A&P Fencing we can supply you with machined rounds and half fence rounds. 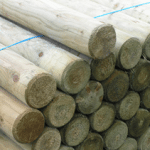 Our planed round landscaping poles are ideal for constructing an attractive retaining wall, while half round rails are ideal for edging borders. Both of which make for transforming an average looking garden into a truly stunning one. We have a range of timber rounds, all listed below. They are available for fast delivery from our West Midlands depots to popular locations including Birmingham, Sutton Coldfield, Great Barr, Tamworth, Lichfield and more. Machined rounds are great accessories for outdoor construction, landscaping and custom fence making. 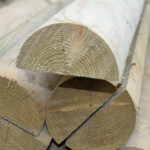 Timber machined rounds are also ideal for using as borders and garden edging. With delivery available in the West Midlands, Birmingham and surrounding areas, we can supply quality machined rounds with quick delivery from our local depot, available in both 3″ and 4″ thickness and half rounds too. Here are A&P Fencing, we have vast experience in manufacturing timber fencing and wooden garden products. We pride ourselves on delivery quality, reliable and well made products. For more information about our products, delivery or for any questions you might have, please contact us.